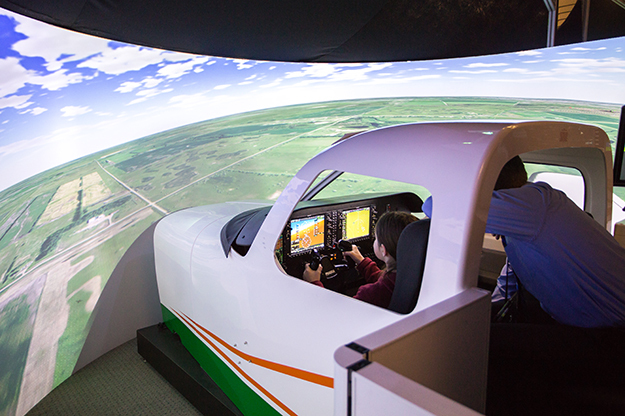 Flying enthusiasts of all ages had the opportunity to hop into one of several flight simulators during UND Aerospace Community Day. This was just one of more than 20 different experiences spread throughout the facilities of the John D. Odegard School of Aerospace Sciences. Photo by Tyler Ingham/UND Today. The energy of the buildings comprising the John D. Odegard School of Aerospace Sciences (JDOSAS) was atypical on Feb. 3, an especially cold and blustery Saturday. Where you would usually see small pockets of students studying in corners or logging weekend flight hours in the simulators, hallways were instead packed with snow boot-clad children, wide-eyed high schoolers, and parents experiencing so much more than a simple escape from the weather. 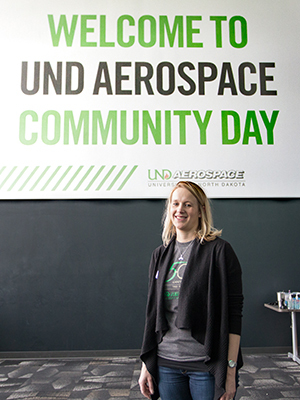 Beth Bjerke, associate dean and event organizer, said Community Day was the college’s chance to open up its doors and show people all of the exciting things happening within UND Aersospace. Photo by Tyler Ingham/UND Today. 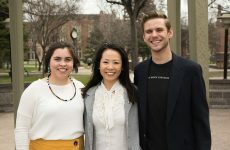 This was UND Aerospace Community Day, an open house celebration to kick off a year of events reflecting on 50 years of JDOSAS education, research and service. 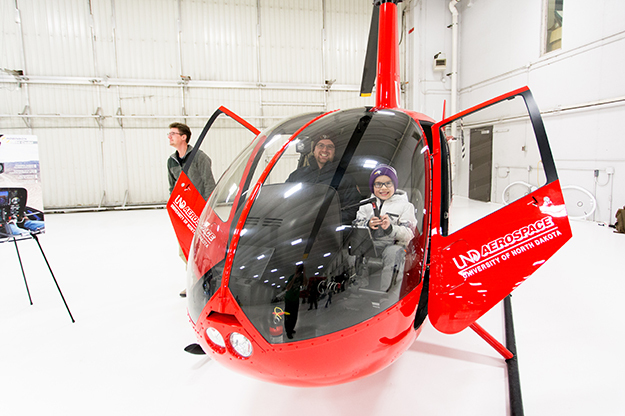 The concept of Community Day was simple – throw open the doors and immerse attendees in the full UND Aerospace experience, from aviation, flight operations and UAS to space studies, atmospheric sciences and sustainability. The all-access opportunity engaged people in unmanned aircraft races, air traffic control simulations, NASA-based crafts and demonstrations and more. Those looking to stretch their brains could sit in on 15-minute faculty and student research talks on topics ranging from thunderstorms to extraterrestrials. Bjerke added that she sees Community Day as a way to reach two communities – not just those outside of the University. 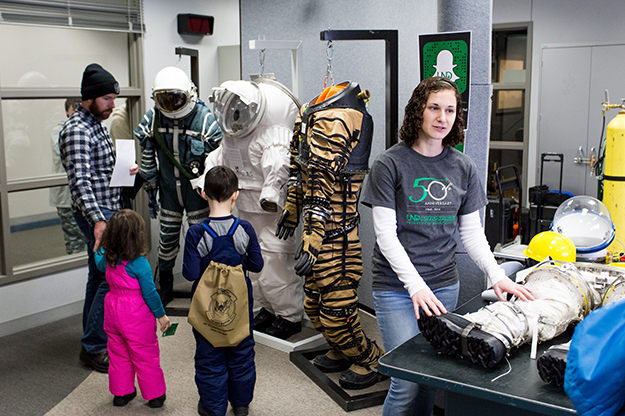 Space studies graduate student Kayla Daniels (right) volunteered her time to assist with the space suit lab, one of the day’s most popular exhibits. 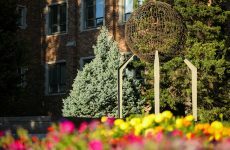 Activities and displays covered all aspects of UND Aerospace – space studies, aviation, atmospheric sciences, UAS and sustainability. Photo by Tyler Ingham/UND Today. Atmospheric sciences senior Kaela Lucke stood in the broadcast meteorology studio of Ryan Hall and posed a question to the young man gesturing in front of a large blue wall. “How’s the weather looking this weekend?” Lucke asked. “Friday, it’s going to be 11 degrees,” the boy replied, seeing a full regional map appear behind him on a nearby screen. Guests of all ages tried their luck at potential new career options, including 13-year-old Shawn O’Hearn from Thompson, N.D. He hopped into a flight simulator, took off, flew in a circle and successfully landed. “I didn’t crash,” he said humbly. 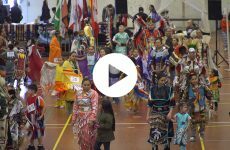 Each Community Day participant was given a map and a passport in which to collect stamps from nearly 20 different activity and display stations, enticing them to check out every nook and cranny of all four campus facilities and the Grand Forks airport. Some came in with already established professional interests. Daniel Smith, a UND air traffic control associate helping out with the ATC simulation station, said he hopes he can play a role in drawing more people into the industry. “I tell them when they come in, you might think back one day, when you’re in this program, that the Community Day you went to many years ago made you fall in love with it – just sitting in the simulator,” Smith said. A shuttle took community members out to the Grand Forks International Airport, where visitors could sit in a plane or helicopter and meet members of UND’s flight teams. Photo by Tyler Ingham/UND Today. A celebration of this size couldn’t happen without an incredible support system. More than 130 faculty, staff and students volunteered to assist with the planning and execution of the event. Bjerke gave special thanks to her core committee, namely the outreach coordination of Caitlin Nolby and Marissa Saad of the North Dakota Space Grant Consortium, the logistical management of Debbie Landeis, Jane Olson and Kelly Sander, and the social media work of UND Aerospace’s Courtney Olson, who Bjerke said used her “creative and marketing genius” to build excitement and drive attendance. Community groups like the Northern Plains UAS Test Site and local law enforcement also gave their time to answer questions about unmanned aircraft. For those needing to refuel between stations, Assistant Professor of Atmospheric Studies Aaron Kennedy was dishing up pizza, with proceeds supporting a new weather-watching Skycam. Beyond manpower, the Grand Forks Convention & Visitors Bureau offered a $500 grant to help with printouts, bags and other materials; the UND Aerospace Foundation provided financial support; and the North Dakota Aeronautics Commission and several aviation companies donated tables and tables of prizes for those who completed their passports. “This is awesome,” said Melissa Cassanelli of East Grand Forks, taking a quick break with her family. “I think we learned a lot,” her husband Mike added, smiling at their son, Andrew.